DITEK's analog video surge protection solutions are designed to protect analog CCTV systems and high definition analog systems such as HD-CVI, AHD, HD-SDI and HD-TVI. The DTK-VM12RM rack mount face plate accepts up to 12 shielded or unshielded Versa-Module surge protectors, utilizing a single point ground. The DTK-VM6WM wall mount face plate accepts up to 6 shielded or unshielded Versa-Module surge protectors, utilizing a single point ground. The DTK-VSPBNCA surge protector is ideal for analog or digital video/data circuits where the AC power is already protected. The DTK-iBNCHD inline surge protector was designed to protect externally-mounted HDCCTV cameras where a dedicated ground connection is unavailable. The DTK-4VP is ideal surge protection for four camera CCTV installations. Each unit protects four BNC video channels. The DTK-iBNC2.8 inline surge protector was designed to protect externally-mounted fixed or PTZ cameras where a dedicated ground connection is unavailable. 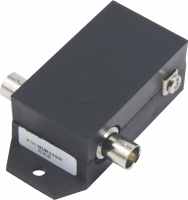 The DTK-GLI Ground Loop Isolator is a passive device that utilizes hybrid circuit technology to reduce video distortion caused by ground loop interference. The DTK-4TPV provides surge protection for twisted pair video lines against surges entering on the unshielded video wiring. The DTK-RM16NM provides head-end surge protection for CCTV video circuits. SAD technology provides optimal protection for analog, HD-CVI, AHD and HD-TVI signals. The DTK-PVP27B provides surge protection for fixed analog and HDCCTV cameras running on coax cabling. Each device protects 12/24V power, and video conductors.